Rajasthan is my favourite state in India. Who can help but fall in love with Rajasthan? A magical state bursting with glittering palaces, majestic forts and romantic lakes. Rajasthan’s regal architecture provides a stage screaming to be filled by musicians wearing brightly coloured turbans and sporting impressive handle bar moustaches. The mesmerising music of the Thar Desert warrants an audience. Rajasthan is one of the richest sources of travelling musicians in the world. The importance of Rajasthan’s traditional folk songs and dance forms were recognised by UNESCO in 2010 when they were added to UNESCO’s Tangible Heritage List. These days Rajasthan’s folk musicians are in demand at world festivals and in Bollywood. Two of the things I enjoy most in Rajasthan are its unique music and its vibrant festivals. I am so excited about returning to Pushkar in December to attend Teamwork Arts’ ‘The Sacred’ festival. Three days to indulge in my passions of; music, meditation and yoga. The Rajputs (Rajasthan royalty) loved to be entertained and called in travelling musicians for every occasion. The nomadic music men led the festivities at births, weddings and deaths. You don’t need to venture into the Thar Desert (although it’s well worth a visit) to enjoy its music. Wherever you are in Rajasthan you will hear the distinct sounds of its traditional instruments; the sitar, nagadas (kettle drums), dholak (drum) and Khartal (like castanets) which accompany haunting vocals. Rajasthan’s travelling musicians originate from a diverse range of castes. The Manganiyars are considered to be descendants of the Rajputs. Manganiyars pass their music down from generation to generation. Manganiyars are Muslims but are famous for their devotional songs to Krishna and other Hindu deities as well as Sufi saints. And, it is this syncretic power of music that ‘The Sacred’ is offering to its audience with a diverse line up of artists. The meaning of ‘Langas’ is song givers. Langas were hired by Rajputs to entertain at births, weddings and deaths. The Langas would make up songs about theRajputs hiring them and lament about harsh desert life. 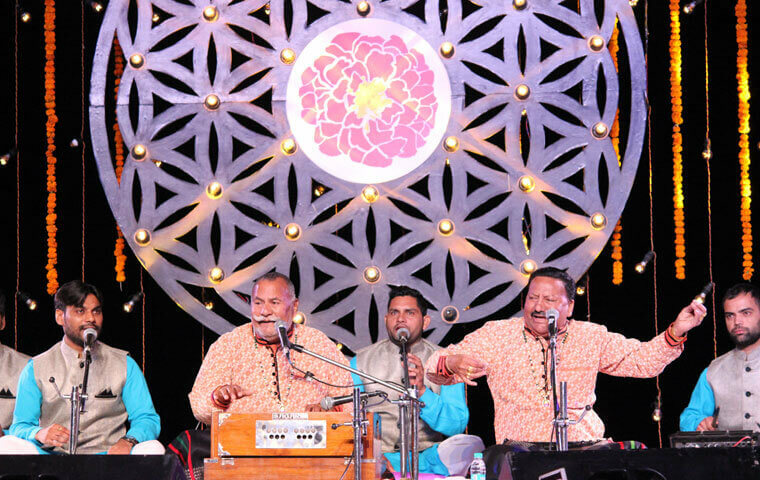 The Langas soulful sounds encompass Sufi qawwalis and Hindu bhajans. The Bopa are the Thar Desert’s authentic gypsy musicians and singers. Bopa music is usually associated with the exotic snake charming skills and dances of theKalbeliya caste. It would be sacrilege to host a festival in Rajasthan without the traditional music of the region. At the Festival, master drummer of Rajasthan, NathuLal Solanki and his team will be performing and hosting nagada (kettle drums) workshops on the ghats as the sunsets behind the Aravlli Range. A sundowner to remember. Teamwork Arts are committed to supporting folk traditions and encourage local artists to perform at their festivals. This gives you an authentic experience and keeps traditional art forms alive for future generations. Will you be you attending ‘The Sacred’ this year? What are you hoping to get out of it? I would love to hear your thoughts on Rajasthani music and ‘The Sacred’.